There are no photos with those IDs or post 26693 does not have any attached images! The specialty of traditional fishing -with death-, will start this year a week earlier with respect to the last seasons. The Auction of the Campanu del Sella moves to Tuesday 16 of April in the Roman Bridge of Cangas de Onís to the 18: 00 hours, it was expected to be the 14 Sunday in April, but it was postponed since no copies of the river were taken. In the 2018 the price at which the salmon was awarded reached the 11.900 euros. The auction is done by show of hands before hundreds of people and media. 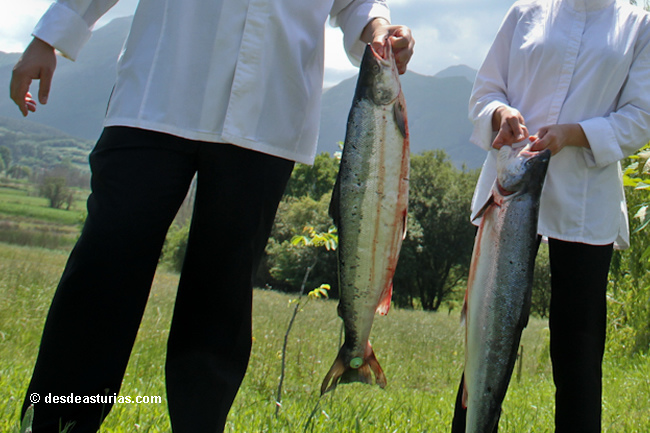 The Campanula del Sella is the first salmon taken on the Sella riverbank of the season, and its auction is the most important act of Asturias in the world of river fishing.